The essence of leadership is change. Change unsettles people and obstacles emerge. Of course, there are those of us that are quick to leap at something new, the ones who normally lead the way. These people, I know from personal experience, are excited by the vision for change and can see potential in the ‘new’ but can be frustrated by those that can’t easily embrace change. 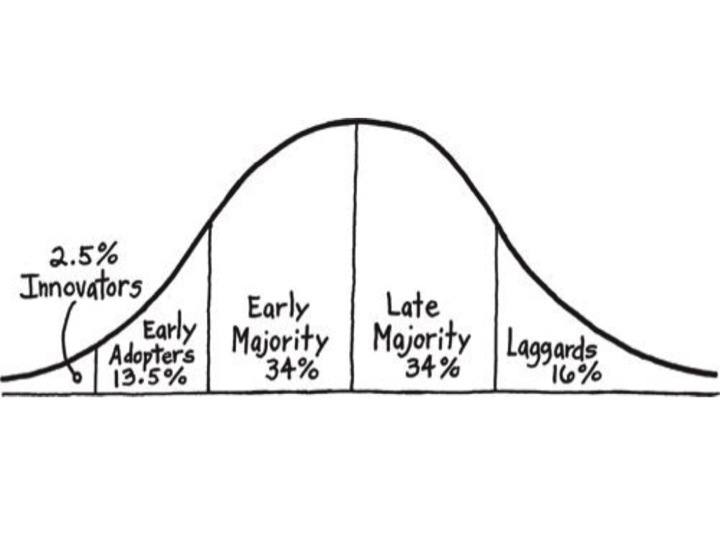 If our role as leaders is to take people through change, it is helpful to consider the Law of Diffusion of Innovation, first developed in 1962 by Everitt Rogers, a professor of rural sociology. This graph helps to explain what is happening internally when people are faced with change. Not everybody will immediately think your plans and ideas are their own next steps. However, as leaders we are in the business of change and movement, not status quo and standing still. When people are complacent they see no sense of urgency. There is comfort in doing what they have always done. Creating a sense of urgency for change, providing the right and timely information can shift people out of self-satisfaction. This needs to be a true sense of urgency. The change agent’s role is to know your people and know that they have different motivators. This will help you to provide the right information, experiences and examples that provides the evidence that change is required. Fear and doubt: Will it be better or worse for me? Overcoming fear and doubt is as much about listening, as it is speaking. We need to stop and listen. Change agents and innovators are excitable individuals. All of our communication needs to appreciate where we are and how we got to be here, and then point to a better future. Unless there is a sense of confidence in the future and in the leaders to take them there, the necessary changes in behaviour will not be lasting. Brain research has taught us about habits. According to Duhigg, habits occur when our brain is in automatic mode. A behavioural cue triggers the brain, a routine kicks in, and then there is a reward. Habits change when the routine changes. The cue and the reward can stay the same, yet behaviour is transformed. Certainty is achieved when people realise they aren’t the only ones thinking this way. The key to shifting the thinking in the late majority is showing them that there is a growing school of thought by many, not just the whacky few. Twitter has been an incredible phenomenon in education. Many of us for many years have longed for change in education, yet felt alone. Being part of a social media tribe, sharing ideas and resources has meant that others thinking the same things can create a movement for change. There is power when we realise we aren’t alone. Leadership takes people on a journey to a better future.